What happens if I do not consent to receive electronic notice? Consent to electronic service is not required when service is made using the Court’s CM/ECF System. (See amendments to Fed. R. Civ. P. 5(b)(2)(E) effective December 1, 2018.) To ensure you receive notice when documents are filed in your cases, check to make sure your email address is correct in your CM/ECF profile. For detailed instructions on how to update your contact information in CM/ECF, see the Court’s website at www.cacd.uscourts.gov/e-filing/maintaining-current-contact-information. What types of cases are designated for electronic filing? All civil and criminal cases are designated for electronic filing. All documents must be filed electronically unless exempted by Local Rule 5-4.2 or Local Criminal Rule 49-1.2. How do I recover my password if I have forgotten it? If you have forgotten your CM/ECF password, please contact the CM/ECF Help Deskdesk for assistance. Should I keep my Login and Password secure? All CM/ECF logins and passwords must be kept secure. The Court recommends that attorneys only share their account information with staff who are authorized to assist the attorney in e-filing. Pro se litigants who have been granted permission to e-file in a case should also ensure that their logins and passwords remain protected. This helps to prevent unauthorized persons from obtaining access to CM/ECF and using it for malicious purposes. If you believe that a compromise may have occurred to your account, please change your password immediately. Click here for instructions on how to update your profile on-line. How do I log on to CM/ECF? On the Court's website click the Login to CM/ECF button on the right side bar. On the CM/ECF login page, you will see instructions at the top stating "If you have lost or forgotten your password, click here". When prompted, please enter the attorney's login and the special code which will appear on the page. When entering your new password, please note that the password box may have characters contained already – delete them (if any) before you enter your new password. Password requirements: minimum 8 characters comprised of upper/lower-case letters and at least one number or special character. Also, please note CM/ECF supports only Microsoft Internet Explorer and Mozilla Firefox internet browsers. If you are still experiencing issues after deleting browsing history and cookies, please contact the Help Desk at 213-894-0242. What if I previously did not consent to receive electronic service of documents and now I want to consent? Consent to electronic service is no longer required when service is made using the Court’s CM/ECF System. (See amendments to Fed. R. Civ. P. 5(b)(2)(E) effective December 1, 2018.) To ensure you receive notice when documents are filed in your cases, check to make sure your email address is correct in your CM/ECF profile. For detailed instructions on how to update your contact information in CM/ECF, see the Court’s website at http://www.cacd.uscourts.gov/e-filing/maintaining-current-contact-information. As long as you are a registered CM/ECF User and your contact information is kept up-to-date in CM/ECF, you should receive electronic notice of documents filed in your cases. What should be done when an attorney leaves the firm? That attorney has an obligation under Local Rules 5-4.8.1 and 83-2.4 to maintain and update his or her business and contact information with the Court and with the parties to any pending action in which the attorney has appeared. For further information on updating an attorney's business or contact information, click here. If the attorney has any cases currently pending in this Court, the attorney (or his or her firm) will also need to file a notice of withdrawal or a request for approval of substitution or withdrawal, depending on the circumstances. For further information on noting a withdrawal and requesting court approval of substitution or withdrawal, click here . Please note that an attorney will continue to receive electronic notices in a case, even after updating his or her contact information with a new e-mail address, until the attorney is terminated from the case. In addition, law firms should make sure that the case docket accurately reflects the attorney(s) of record and that the attorney of record is properly set up to receive e-mail notifications. This may require filing a notice of appearance. For further information on noting an appearance, click here. If I am not an attorney, can I e-file? Pursuant to Local Rule 5-4.1.1, a non-incarcerated pro se litigant may seek leave of Court to use CM/ECF to file documents electronically in a particular case. How do I add counsel to a case? To add counsel in a case, electronically file a Notice of Appearance or other such document in the specific case. 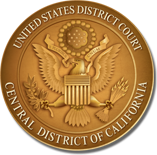 Can I use the login and password issued by another court to e-file in the Central District of California? No, each district court has its own registration requirements, e-filing policies, and procedures. After you have complied with the requirements of becoming an ECF User the court will issue you a login and password. Once the initially assigned login and password is received, you may change you password through CM/ECF. Why do I get an invalid login message once I have already logged into the court (CM/ECF site) and I am retrieving a docket or document? Make sure you put in your PACER login and password at the second login screen. Verify that the recommended browser is being used . Your PC needs to be set to accept all cookies. If the problem persists, log out, delete your existing cookie and internet files. Why am I getting an invalid login error? Both the login and password should be entered in lower case letters. Be sure you don’t have the "all caps" mode turned on. Verify that one of the recommended browsers is being used Internet Explorer (version 6 or higher) or Mozilla Firefox 1.5 or higher. I am changing firms. Do I need to establish a new e-filing login and password? No, you do not need to register for CM/ECF more than once. Your CM/ECF User login is issued specifically to you. Even if you change firms, your login remains valid. However, you must update your address, including any changes to your e-mail address, in CM/ECF (see Local Rule 5-4.8.1). For detailed instructions on how to update your contact information in CM/ECF, see the Court’s website at www.cacd.uscourts.gov/e-filing/maintaining-current-contact-information. In addition, if you are counsel of record in any cases currently pending in this district, you must file and serve Form G-06 (“Notice of Change of Attorney Business or Contact Information”) in each of your pending cases. Doing so will satisfy your notice obligation under Local Rule 83-2.4. Yes. The system requires two separate logins and passwords, one for PACER and the other for CM/ECF. A PACER login and password are required for querying cases and are provided by the PACER Service Center. To contact the PACER Service Center, please call (800) 676-6856 or visit their website at http://www.pacer.gov. A CM/ECF login and password are required for an attorney who needs to electronically file documents and view documents restricted to the Court and counsel of record. An online request form must be completed by the attorney to whom the CM/ECF login and password will be issued. Can any member of the public use CM/ECF to e-file documents with the court? No. Access to the filing portion of CM/ECF is only available to registered ECF Users. Yes, the public can access case data in CM/ECF unless it has been sealed or restricted by the court or by statute. The public access component will require a user to enter a PACER login and password. Because the PACER login and ECF User login are different, a filing attorney will need both. Established PACER users will automatically have access to these sites; a new account does not need to be created. For those currently not registered with PACER, a PACER account may be obtained at: http://pacer.psc.uscourts.gov/register.html. Why am I having problems with my E-filing login and password? Are you using the correct login and password? PACER and E-Filing in CM/ECF require two separate login and passwords. Please confirm you are using login and password assigned for electronic filing into the CM/ECF system. Are you on the correct website? Please make sure you are clicking the Login to CM/ECF button on the right side bar. Each federal district court requires a separate login and password. Please confirm you are logging into the link associated with California Central District Court. If you are accessing CM/ECF through PACER’s website for public query only, you only need your PACER login and password. You will not be able to e-file or view restricted documents. If you are accessing CM/ECF through the E-Filing website, you first need to login using your E-Filing login and password. This will allow you to e-file documents. If you are in this website and want to query, you will be presented with a new login screen which will ask you for your PACER login and password. If your login and password still does not work, please e-mail or call the CM/ECF Help Desk for assistance. How do I receive a login and password? An attorney who has been admitted to practice in the Central District of California must complete the online request form for a CM/ECF login and password. If the attorney has any cases currently pending in this Court, the attorney (or his or her firm) will also need to file a notice of withdrawal or a request for approval of substitution or withdrawal, depending on the circumstances. For further information on noting a withdrawal and requesting court approval of substitution or withdrawal, click here. Can I loan my login and password to another attorney who doesn’t have one? No. Each attorney is assigned an unique login and password. It constitutes the filing attorney's signature to the document. As is the case with paper filings, it is the filing attorney's responsibility for the document. If an attorney is not listed as counsel of record, but files a document to the case, they may be added as attorney of record inadvertently. Why can I get a docket sheet, but not any of the documents provided? This court did not become a full e-filing court until January 1, 2008. If the document number is not underlined (a link), the document was filed prior to the full e-filing date and is not attached to the docket sheet. These documents can be viewed in the Records section at the courthouse. For details, please go to the Records Department page. This issue may also occur if you are using an incompatible browser. Check your browser settings. Also confirm that you have a PDF viewing software installed (ie Adobe Reader) You may have PDF viewing software on your computer but have not connected it to a browser. If you are using MacIntosh/Apple computers and software, we recommend you use the latest version of Safari or download the free version of Mozilla Firefox and use this browser for all CM/ECF related transactions.